AUD/USD paced back and forth between the 1.0750 minor psychological resistance and the 1.0600 handle for the entire week. A weak U.S. ADP figure may have stirred risk aversion and dragged the pair to the 1.0600 support, but a strong Australian retail sales report pushed it back up. Aside from that, the worse than expected U.S. NFP report triggered a dollar selloff and carried AUD/USD all the way up to 1.0750 again. I could’ve gone long at 1.0600 and aimed for the 1.0750 resistance. With a 50-pip stop and 1% risk, I could’ve bagged 3% on this baby! 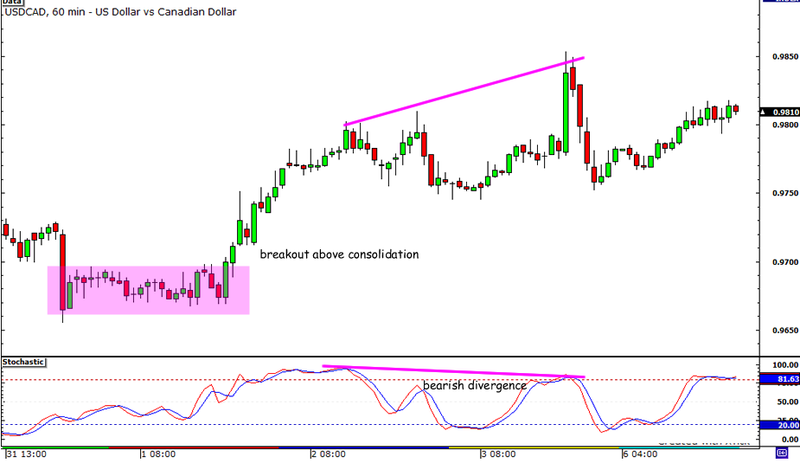 Next up is this breakout trade from the Loonie. As you can see from the chart above, USD/CAD consolidated right below the .9700 handle before breaking out and shooting up. At first, I thought it weird that the Loonie fell when the U.S. released weak data, especially since the BOC is definitely more hawkish than the Fed. But when I read Pip Diddy’s daily forex fundamental commentary on the Loonie, I learned that the Canadian economy also stands to lose when the U.S. is showing signs of a slowdown. Anyway, had I gone long at .9700 and aimed for .9850 just when that bearish divergence formed, I could’ve made 150 pips on the trade. Again, risking 1% with a 50-pip stop would’ve been a nice 3% win! 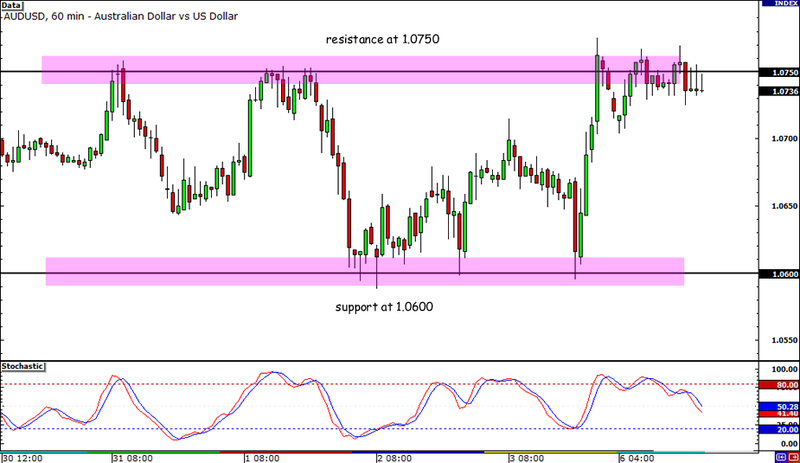 Lastly, here’s a short trade setup on NZD/USD. 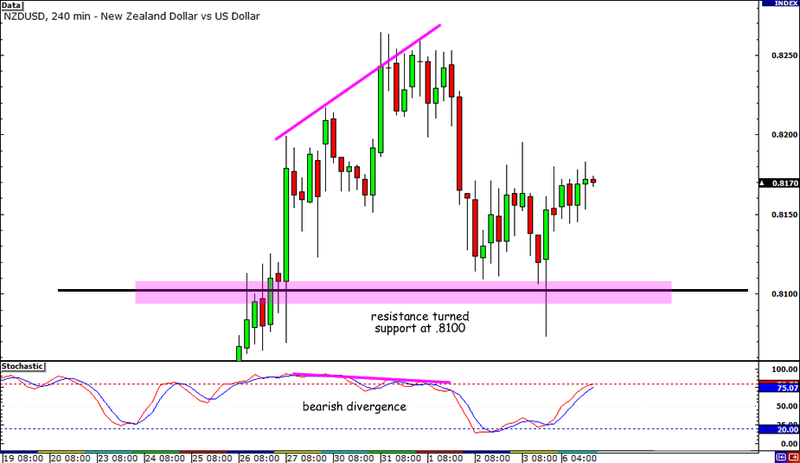 A bearish divergence formed when the price found difficulty breaking above the .8250 minor psychological level. Shorting at the .8250 level and aiming for .8100 would’ve been another 150 pips. Oh how I wish I caught this move! Had I risked my usual 0.5% on this short trade, it still would’ve yielded a 1.5% win! Okay, enough daydreaming. Time to get back on the grind and hunt for those winning setups. You know what they say, hindsight is always 20/20. I sure hope my trading vision for this coming week is just as clear! Wish me luck folks! So What Moved the Comdolls Last Week? Good morning, my beautiful friends! As much as I want to stare at Roger Federer battling Rafael Nadal all day, I’d rather spend time writing my comdoll replays for you! The comdolls were off to a shaky start last week when traders from the U.S. and the U.K. started the week with bank holidays, which drained around two-thirds of trading volume. Good thing the comdoll bulls made up for the lost time on Tuesday when they boosted both the Loonie and the Kiwi on hawkish RBA statements, better-than-expected Canadian GDP report, and strong New Zealand business confidence. The Aussie bulls weren’t able to join the party though, as a weak building approvals report made them edgy on buying up the Aussie. In the middle of the week the comdolls caught a classic case of midweek reversal as weak employment reports from the U.S. and a sharp slide in Austrailia’s GDP hampered appetite for high-yielding currencies. Australia‘s GDP surprisingly contracted by 1.2% in the first quarter from its 0.8% growth in the last quarter of 2010, while the ADP report from the U.S. showed a steep drop from 177,000 to only 38,000 additional non-farm-related jobs in May. Eeck! Near the end of the week we saw mixed price action from the comdolls as better-than-expected economic reports played tug-o-war with a weak NFP report, weak dollar, and a bit of risk aversion. We saw the Kiwi make record highs against the Greenback, while the Aussie pocketed most of its gains. Meanwhile, the Loonie bulls held back from the comdoll rally because of concerns on Canada‘s dependence on the strength of the U.S., its largest trading partner. All right, that’s it for me today! Got any questions for me? I’d be happy to share with you my two cents on everything from Canada’s relationship to oil and the U.S. economy, to Federer’s best tournament outfit! Don’t hesitate to hit me up on my @happy_pip Twitter and Facebook pages, okay? Or better yet, drop a thought or two on the comment box below!